The riders from the Repsol Honda Trial Team, Toni Bou and Takahisa Fujinami, were given a public presentation this afternoon in Milan, Italy in an event which took place at the EICMA motorcycle show. 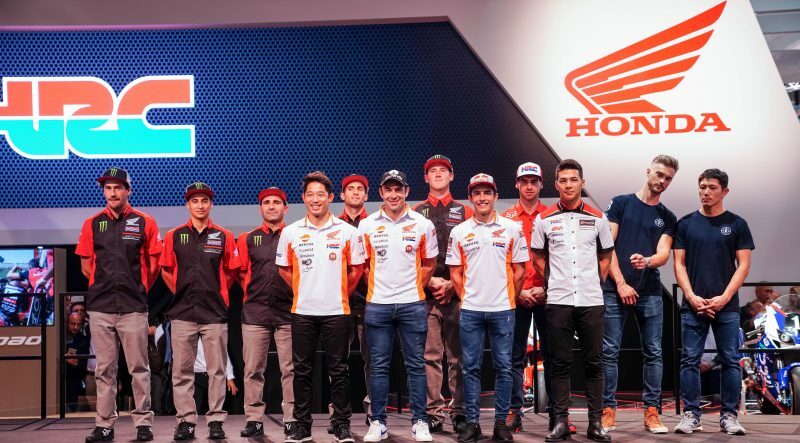 The various 2019 HRC teams scheduled to compete in MotoGP, Rally, Motocross and Trial bike categories were all unveiled this afternoon at the EICMA International Motor Show, which opened today in Milan giving professionals the world over a first glimpse of this year’s novelties. 24-time Trial world champion Toni Bou and his team-mate at Repsol Honda Team, Takahisa Fujinami, world champion in 2004, were greeted with applause by spectators at the presentation, attended by some of the industry’s most prestigious journalists. Superbike World Champion James Toseland and journalist Suzy Perry, who presented the members of the HRC teams asked team rider Toni Bou how he stays so motivated after multiple victories, and quizzed Takahisa Fujinami about how he has managed to stay active in top level competition for so long. Also in attendance and actively supporting at the event was Yoshishige Nomura, HRC President, and Noriaki Abe, Chief Officer of Honda Motors. Honda will be on display at the EICMA show featuring the very Montesa Trial models which the Repsol Honda Team riders use to compete. Those attending EICMA will be able to find them in Pavilion 22, Stand O48. After twelve years full of triumphs, it is difficult to continue along this positive line of successes. However, this last year was very difficult because of the back injury. Now, that I am 100% recovered, I have a great motivation to enjoy each training session and I continue to improve as a rider, and hope to carry on achieving the greatest number of successes for Repsol Honda Team. I really love trial. Training day by day is a pleasure for me and in the races I really like to feel the warmth of the crowd which makes me deliver much more. This was the case since I first started in the world championship in 1996, and I think that after twenty-three years it still motivates me to train every day, participate in the trials, be part of a team like HRC and Montesa-Honda and, above all, I am very motivated by the support and affection from the spectators. This entry was posted in Enduro, Global News, Lifestyle, Moto, Motorsports, Offroad by admin. Bookmark the permalink.